We are excited to offer the fifth annual Kicking Cancer youth soccer camp. 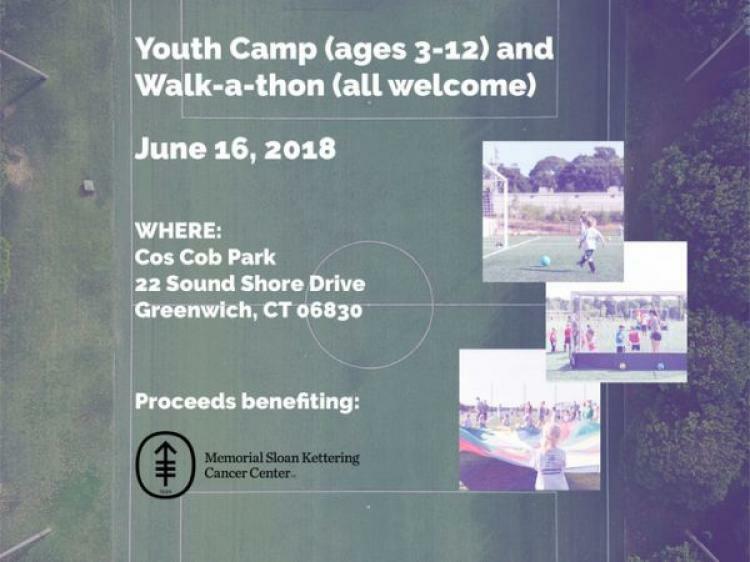 Kicking Cancer is a nonprofit camp dedicated to teaching children the game of soccer, the benefits of being active and educating parents on ways to help prevent cancer. Thanks to our generous sponsors, proceeds from registration and any funds raised will be donated to Memorial Sloan Kettering Cancer Center. LWDF was founded on the belief that the end of cancer begins with prevention. Instead of focusing on what we don’t have – a cure, we help people utilize what we already know and help bring the fight to cancer. LWDF is a 501(c)(3) under federal tax guidelines. A chance for everyone to participate - for each lap you complete around Cos Cob park (1/2-mile loop), you can earn a raffle ticket and a chance to win great prizes! Each KICKER will be provided with coaching and training from the likes of Soccer with Aldwin, the varsity women's soccer team of Greenwich High School and two former WPSL REAL SALT LAKE women's soccer players.Kickers will be in small groups and led through warm ups and fun drills that will introduce them to soccer and basic skills. We incorporate a lot of games and activities (including non soccer related) into Kicking Cancer which will be great for younger children who may not be interested in soccer and have a shorter attention span! Senior kickers will focus on building proper technique and learn drills to improve their existing ball skills. Memorial Sloan Kettering Cancer Center is the world’s oldest and largest private institution devoted to prevention, patient care, research and education in cancer. Its scientists and clinicians generate innovative approaches to better understand, diagnose and treat cancer. The Center’s specialists are leaders in biomedical research and in translating the latest research to advance the standard of cancer care worldwide. For more information, go to click for details.